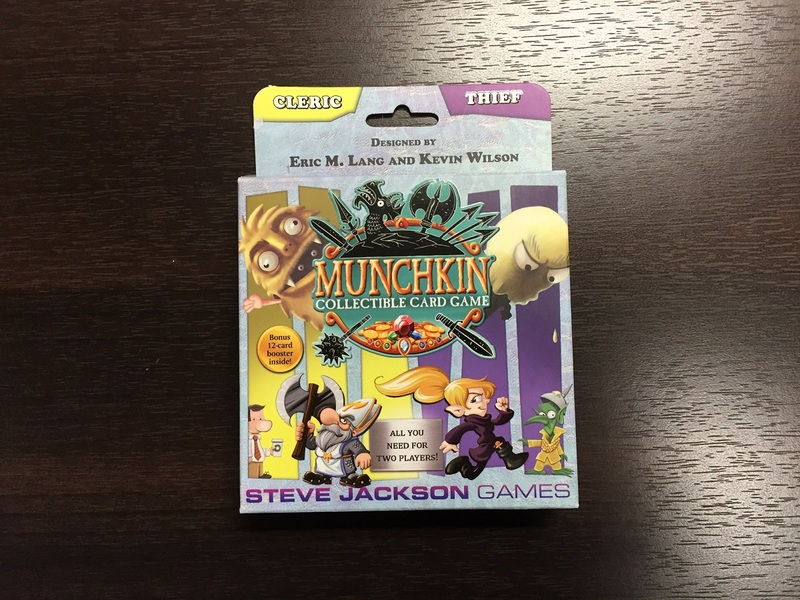 The first thing to realize when you hear about the Munchkin CCG is that while there is a similar tone to the game, it shares almost no mechanical similarities to the original Munchkin line of games. Instead of trying to be the first adventurer to reach level 10, the object of the game is to reduce your opponent’s health to zero, or mill their deck so that it is gone. If you are the first player to do either of those, you win. Now, let’s look at the contents of the starter. 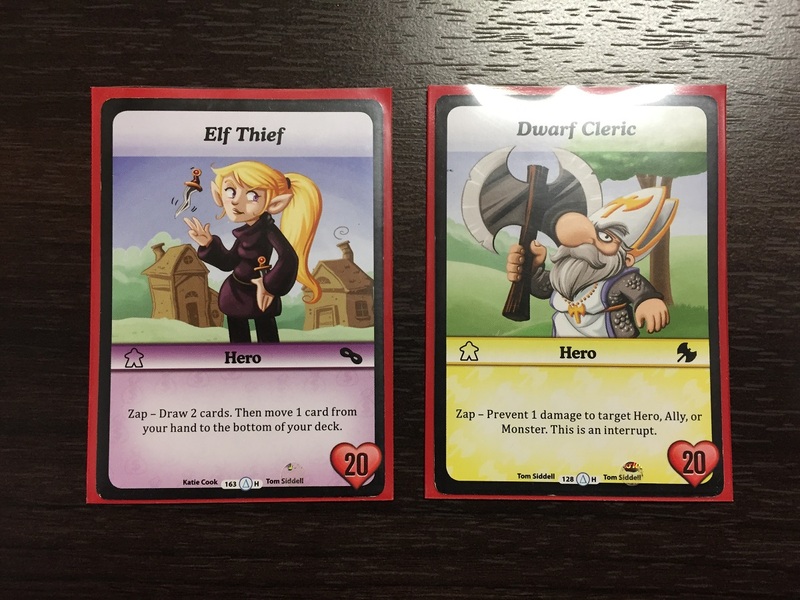 We all know my love of 2-player starters, and the Munchkin CCG has three that you can choose from. Each one is a ready-to-play kit, with two preconstructed decks, a die, tokens, rules pamphlet, and even level dials. Before we get to the cards, let’s look at the non-card items. The tokens include numbered tokens in 1 and 5 denominations. 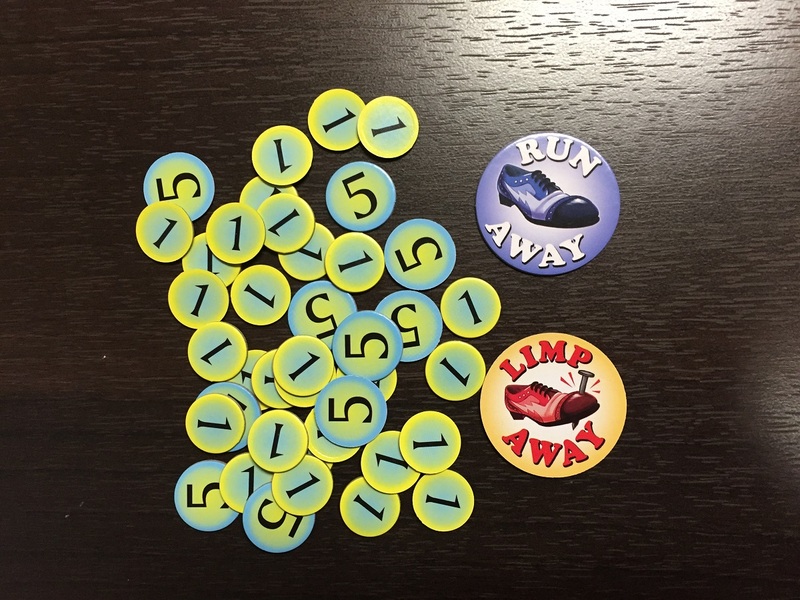 The tokens are catch-all, meant to be used as damage counters, gold counters, and anything else you might need to keep track of during the game. The other tokens are the Run Away/Limp Away tokens. These are used, of course, when you either run or limp away from danger during the game. The two dials are used to keep track of your character’s level. It will steadily go up as the game goes on, which will also dictate how much gold you get at the start of the turn. Unlike Original Recipe Style Munchkin, you don’t win when you hit level 10, as mentioned above. So, getting there first is cool, but not a thing to really brag about. There’s a single die in the set. Now, I have to say, while everything in the set is of good quality, I was disappointed in the die. 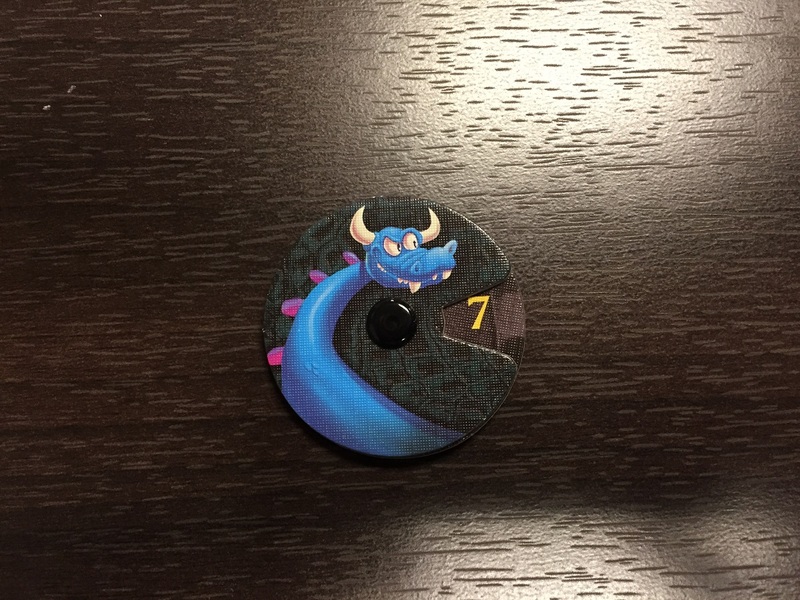 Reason being is that every Munchkin set I’ve known has a custom die, related to the set. 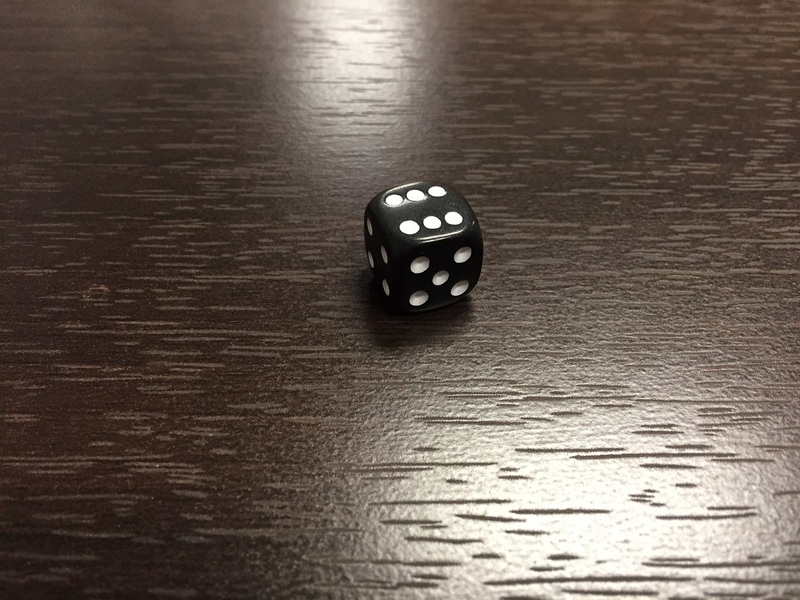 One of the sides is a custom symbol, or even just the “Munchkin Head.” This die just has pips on each side. Again, it’s a decent die. Rolls well, and such, but I was kinda just hoping it’d be a custom die. Oh well. As for the cards, quality-wise, they’re good, sturdy cards. They’ve got a good “flick” to them. Nice finish. Not being a heathen, I sleeved mine before shuffling and playing. Hey, they might be just a review set, but still, I’m civilized. The cards fit into standard-size sleeves just fine. There are 6 types of cards in the game. Let’s go over them quick. Hero cards are unique in that you only get 1 per your deck, and it’s not shuffled in. It represents the player in the game. Each has a special ability as well as a life total. If that total goes to 0, you’re out. Players can have 1 Location in play at a time. If you want to play another, you have to Squish your first one. They have a general ability that usually affects both players in some way. Loot comes in all forms. They can be weapons that will help you in battle, or just other types of gear that gives your hero a buff of some kind. The number in the star in the upper-left corner shows the level of that gear. A hero can only have gear levels equal to their character level. So, for example, a level 6 character could have 1 level 3 gear and 3 level 1 pieces of gear. But if they wanted to equip a level 2 gear, they’d have to either Squish two of their level 1s or their level 3. Allies can be hired by a Hero in order to keep them alive. Their cost is in the little gold circle in the upper-left. They may have some sort of special ability. Then, their life total is in the bottom-right. If an Ally takes damage equal to its life total, they’re Squished. The last type of card is the Monster. They have their cost, as others, in the upper-left. They also have a power and a life total. Some monsters have special abilities that happen when hired (or other type of trigger has happened). Heroes will use the Monsters that they hire to attack their opponent. So, that’s the type of cards. Before the game, players will construct 40 card decks (not including their Hero card). There are a couple rules for deck construction. 1) You can’t go over 40 cards. 2) Cards must either be the same color as your Hero or they must be Neutral (silver). 3) You can have up to 3 copies of a card in your deck. No more. Other than that, it’s really up to you to decide how you want to distribute your cards among the 5 types that go into your deck. All that being typed, how does the game work? Well, you’ve got your deck and your opponent’s got theirs. Randomly determine the first player. They get 1 gold. Their opponent gets 2. Both players start at Level 1. Both players draw a hand of 6 cards (you can mulligan once if you want). From there, you’re ready to go. A game round consists of 3 phases: Warmup, Munchkining, and Cooldown. The Warmup phase is a preparatory phase. Things that are left over from your last turn are reset, including flipping your Run Away token back to that side, collecting any cards from your Stash, and unzapping any cards you’ve got. You also draw a card. Warmup is also where the Reckoning Phase happens, if you’ve got any cards that specifically mention that. 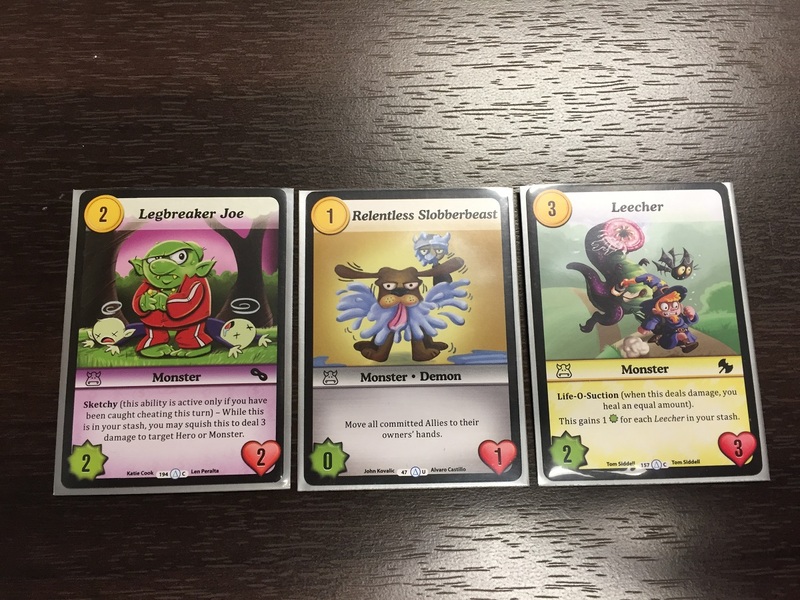 The Munchkining phase is where you’ll spend the bulk of your turn. 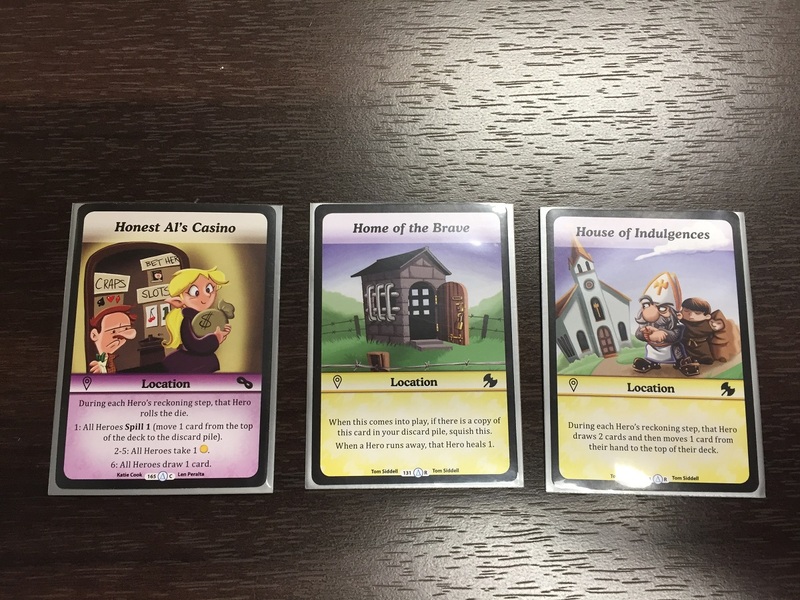 This is where you’ll purchase Allies, play most Mischief cards from your hand, equip Loot, place Locations, and attack your opponent with Monsters. Now, long-time readers of TGN know that I’m a fan of bluffing games. 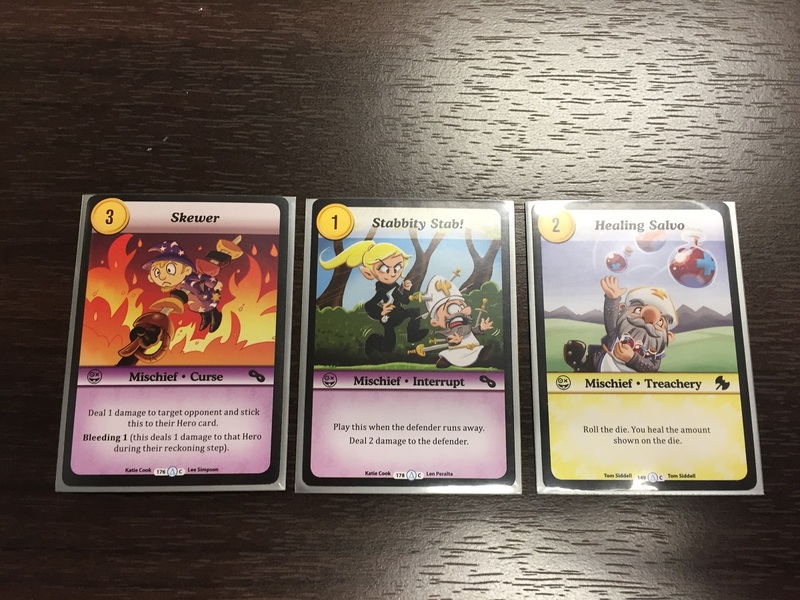 And the Munchkin CCG’s attacking step is all about bluffing. You see, to attack with a monster, you place a card from your hand, face down, out between the two of you. You then place as many gold from your purse next to the card as you want. At this point, your opponent has a choice. They can either Run Away or Face the Monster. If they Run Away (or Limp Away (taking 2 damage to do so), if they’ve already Run Away once during the turn), your gold comes back to you, the card goes to your Stash (still face-down), and you continue on. However, if they choose to face the monster, they can commit Weapons and Allies to the fight, Zapping them to do so. The face-down card is now revealed. If it’s a Monster, and you’ve paid enough gold to hire it, the Monster fights. If there’s a special ability on the Monster, it happens, and then any Weapons your opponent has strikes at the Monster. Then, assuming the Monster is still there, it deals damage to Allies and then the opposing hero. This damage can be decreased by committed Weapons. The Monster then goes to the Stash, face-up. However, you don’t have to use a Monster, or you don’t have to spend enough Gold to hire it. In this case, you’ve Cheated (proper-wise, like, legitimately Cheated). When you Cheat, the card you used goes to your Stash face-up, you take 1 damage (you naughty thing), but your opponent’s committed Weapons and Allies go back still Zapped, so they can’t be used again. This is a great way to wear through your opponent’s defenses so that you can get monsters through later on. You continue on buying, equipping, and sending in Monsters until you’ve had enough. It’s then time for the Cooldown phase. At this point, you’ve worked hard, so you gain 1 Level, as well as get paid, getting Gold so that you have as much Gold as your Level (so, if you are now Level 3 and you had 1 Gold still left over, you would gain 2 Gold). Play then passes to your opponent, who now has a chance to do all that nasty stuff back to you again. As I mentioned before, play continues until 1 player is left with any health or cards in their deck. They are the winner! 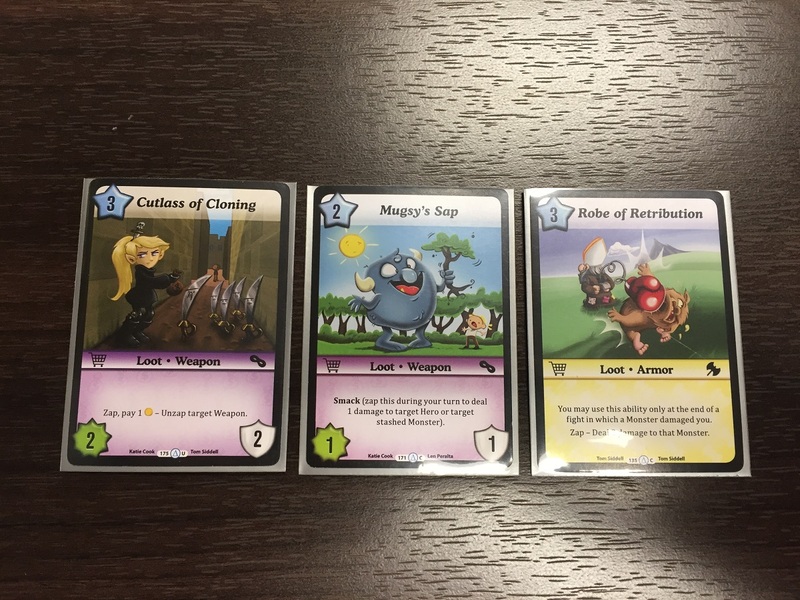 The Munchkin CCG is an interesting mix of bluffing, hand management, and deck construction. Since Monsters keep coming back around to your hand from your Stash, they can return to wreak havoc on your opponent time and again, unless your opponent can manage to Squish them with their Weapons. Expensive monsters can do some real damage, but your opponent can always just Run Away if they think the baddy is just too bad. It’s all about knowing when your opponent is ripe for the attack that you send out the mean stuff… or you could just cheat and make them take extra damage they don’t have to take by Limping Away from nothing. 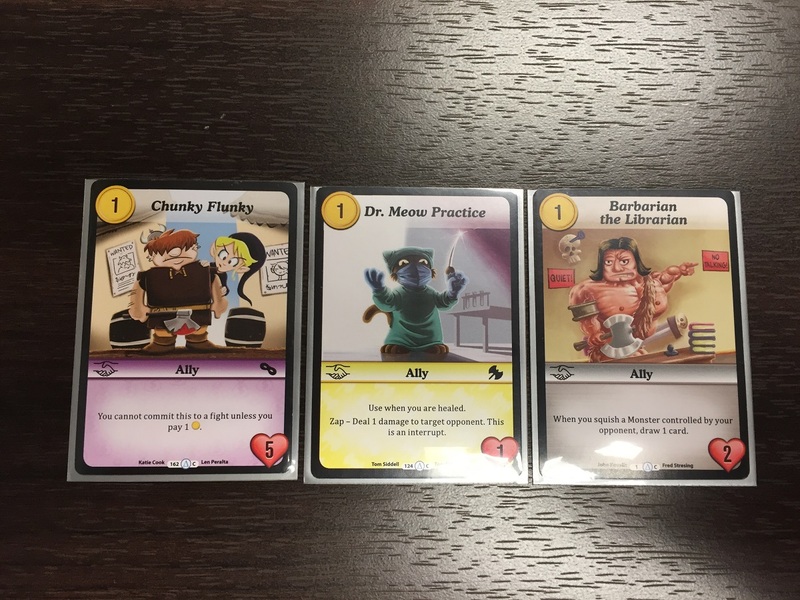 The Munchkin CCG will be on store shelves later this month. You can find out more info on the game's website, as well as get your pre-orders, too!